Heat the oven to 325° Fahrenheit. Put the butter and sugar in a large bowl and beat until light and airy. Add the egg, a little bit at a time, and continue to mix until combined. Add the vanilla, orange and lemon. Sift the flour, any ground spices and salt together. Add the flour mixture, ground almonds and whole spices (if any). Use a wooden spoon and then your hands to mix until dough is formed. Wet your hands and pull off walnut-size pieces of dough, weighing less than 1 oz each, and roll them into 1.25 inch balls. Divide these between two large parchment-lined trays, spaced well apart; you should end up with about 28 balls. Press your thumb into the middle of each to make a 2cm-wide dimple. Bake the biscuits for 20 minutes, until they have started to turn golden-brown. As the cookies rise, you may find that you need to remove them from the oven after 10 minutes, to re-press the indentations. Variations (*): Should you wish to use Le Bon Magot® Spiced Raisin Marmalata with Ras al Hanout & Smoked Cinnamon, we recommend replacing 1 tsp caraway with 1 tsp cinnamon, ½ tsp crushed cumin seeds and 1/8 tsp ground cloves. 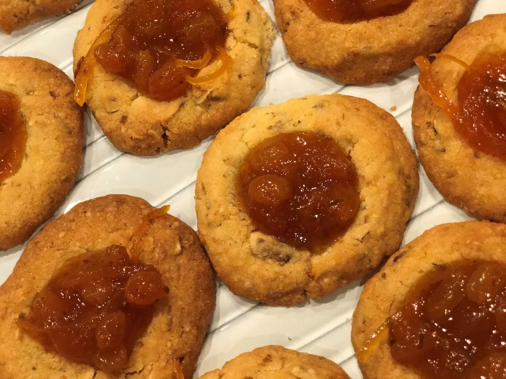 This marmalata also does not need heating before spooning into the cookie holes. Should you wish to use Le Bon Magot® White Pumpkin and Almond Murabba, preserves with cardamom and vanilla, we suggest the following spice blend: replace 1 tsp caraway with 1 tsp cinnamon, ¼ tsp nutmeg and add additional ½ tsp vanilla extract. This jam will need heating before filling the cookies. Put the jam in a small saucepan, warm through until it starts to bubble, then, spoon into the cookies while still hot. One of our favourite preserves is black mulberry. Replace 1 tsp caraway with 1 tsp cinnamon, ¼ tsp ground cloves, 1 tsp crushed fennel seeds and add additional ½ tsp vanilla extract. This jam will also need heating before filling the cookies. Put the jam in a small saucepan, warm through until it starts to bubble, then, spoon into the cookies while still hot.